It’s become something of a habit – mainly because of writing this blog – to chase up the back-story of any vaguely unusual natural history I come across, because there’s nearly always something interesting to learn. Finding a gaudily-cloured caterpillar once led me to read an entire book on aposematism that gave me entirely new insights into the history and sociology of science. I wondered if some such discovery might be so in the case of this wee lass, who appeared uninvited in the window-recess of my study earlier this week. Do you recognise her? The second picture, whilst a bit blurred because I had to stand on my desk and avoid squashing the keyboard to take it, gives a clearer idea of the morphology – particularly the long “neck” (pro-thorax), the 4 wings and the scimitar-like ovipositor. A check in my pocket insect book showed it to be a snakefly, one of just four British species of the genus Raphidia and order Raphidiidae. 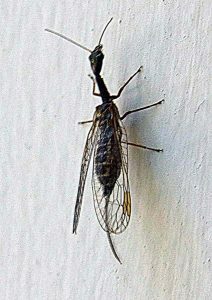 Looking a bit further on the web I found that the snakefly achieved a small measure of fame in 2009 by being voted the ugliest bug in a poll purportedly linked to some scientific purpose in some way. I think it’s pretty handsome, myself, but I never got to cast my vote. The other interesting thing about that article is that the biology of snakeflies was virtually unknown until 1960, and since then most of the work has been done by just one man and his wife, he being the author of the article, Horst Aspöck, by all accounts an accomplished and culturally erudite entolomologist. I still find it wonderful that nature is so rich that a man can spend his entire career pursuing one small order of insects (though Aspöck’s industry is shown by his actually devoting himself to two small orders!) As a biographical article about him says, such specialisation comes close to meeting, on a small scale, Linnaeus’s ideal of a complete classification of the world – a leftover from the mediaeval principle of plenitude on which so much modern science was founded, if only we remembered the fact. 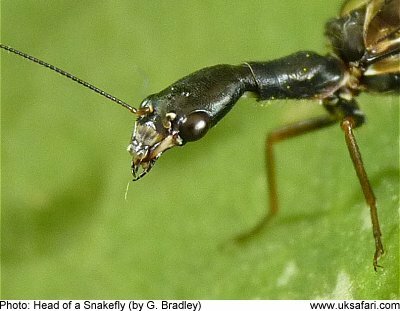 For the last decade or so, however, it seems more interest has been taken in the snakeflies (just think of all that going whilst most of us were unaware there even was a such a creature! ), and especially in China, as so often nowadays, where amazingly preserved fossils are abundant. 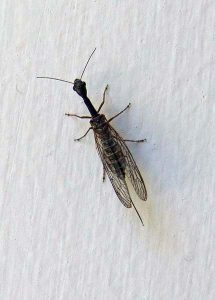 Adult snakeflies have repeatedly been observed to feed on pollen, and pollen is sometimes found in the gut when imagoes are dissected. Whether pollen is necessary, or whether it improves the condition (or prolongs the lifespan), is not known. This perhaps ties in with their original diversification (according to the fossil record) in the Jurassic, from just a few fossil species to 70 or so, diminishing again towards the end of the Cretaceous. For as we all know it is believed that flowering plants originated in the Triassic, and diversified greatly in the Jurassic, which makes a new pollen-eating specialist appear plausible. In this paper, we report a new snakefly family, Juroraphidiidae fam. nov., based on exquisitely preserved fossils, attributed to a new species Juroraphidia longicollum gen. et sp. nov., from the Jiulongshan Formation (Middle Jurassic) in Inner Mongolia, China. The new family is characterized by an unexpected combination of plesiomorphic [ancestral] and apomorphic [original] characters of Raphidioptera. Based on our phylogenetic analysis, Juroraphidiidae fam. nov. together with Raphidiomorpha form a monophyletic clade, which is the sister to Priscaenigmatomorpha. The snakefly affinity of Priscaenigmatomorpha is confirmed and another new family, Chrysoraphidiidae fam. nov., is erected in this suborder. Juroraphidiidae fam. nov. is determined to be a transitional lineage between Priscaenigmatomorpha and Raphidiomorpha. Diversification of higher snakefly taxa had occurred by the Early Jurassic, suggesting that these insects had already had a long but undocumented history by this time. I note in passing that the ancestry presumed from both cladistic and genetic methodologies differs significantly, and in a typical way, from what is found in the fossil record. 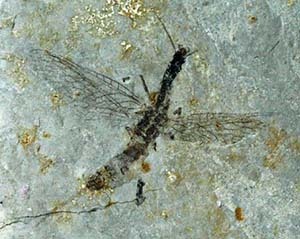 Snakeflies are not hard to find in the Jurassic, but have not been found at all in the Triassic or Permian periods (the meaning of “undocumented history”), a period of over 51 million years. There are tree rings aplenty, but no actual trees. [T]here has not been any study on the function of the prolonged prothorax in Raphidiidae during pollen-feeding. Nonetheless, specialized morphological traits of some Mesozoic insect pollinators have been reported to have coevolved with certain host plants. If Juroraphidiidae fam.nov. possessed pollen-feeding habits, was the extreme elongated pro-thorax evolved for obtaining pollen from some coeval plants with deeply seated pollen chambers? This hypothesis will have to be further tested using more evidence. Such a hypothesis, of course, presupposes an adaptational origin for the long pro-thorax. If instead the neutralists are correct, then I suppose it has no reason and just happens to be that shape. But here’s the thing that intrigues me most. From the Permian to the Jurassic, their ancestors seemingly diversified rapidly to the extent that the mixture of ancestral and specifically “snakefly” characteristics in the new family was “unexpected”. But for the period since the population bottleneck at the end of the Cretaceous – a period of the same order of magnitude – they’ve stuck to what they always were to the extent that they are, even in the biological literature, deemed “living fossils”. Since they are no longer observed to pollinate especially deep flowers, why was this adaptation not selected out? And if the body plan was just a fortuitous non-adaptive trait, why has purifying selection left it alone for 170 million years or so? The population geneticist would say that morphological stasis does not mean evolution has not been happening. Indeed it must, by the the very principles of genetics. But a rose with any other genes is still a rose, and likewise a snakefly. Might it not be that the body plan has little or nothing to do with Darwinian evolution or Kimurian evolution, and that something completely non-evolutionary dictates form? I did ask my snakefly about that, but she just wiggled her head mischievously and flew off in search of some other insect to eat. Predation is in her DNA… maybe. Below the k-t line , a YEC , would say all fossils are from creatures who died in the first days/weeks of the great flood. So diversityt in these bugs is not defined by thesemade up- terms of Jur/crea etc etc. Yes they were more diverse before the flood and after had to start over again. Being bugs it was easier to survive. Bigger creaqtures simply couldn’t. So they are no living fossils but a living proof of error in geology/biology concepts. Love this kind of information Jon! Why does some life change? And why DOESN’T some life change? This is an excellent example of the “X-factor” in living things that makes them different from inanimate objects (like atoms, molecules and compounds). Chemical reactions happen at known rates and that’s that – define the initial conditions and you always get the same result. Life? Not so much. Of course, things are easier to define in Chemistry or Physics but in Biology, hmmmm… There is much work to be done in crafting a fuller, more complete theory of life. Thanks for the insights. Why does some life change? And why DOESN’T some life change? Why indeed Ron. I see form an news article today that many of the current groups of birds, like owls, raptors and woodpeckers, appeared within maybe 4 million years of the KT extinction. All the newly vacated ecological niches may provide an excuse, if you had a theory for successful massive variation in the first place.